Learn about FASTQ, SAM, and BAM. In this section we will look at practical aspects of manipulation of next-generation sequencing data. We will start with the FASTQ format produced by most sequencing machines and will finish with the SAM/BAM format representing mapped reads. The cover image above shows a screen dump of a SAM dataset. Create a new Galaxy history at https://usegalaxy.org (don’t forget to log in). These are paired end data (see below for explanation of what paired-end is) for a single Illumina run. Keep Galaxy history for later. We will need it again in a few minutes. FASTQ is not a very well defined format. In the beginning various manufacturers of sequencing instruments were free to interpret FASTQ as they saw fit, resulting in a multitude of FASTQ flavors. This variation stemmed primarily from different ways of encoding quality values as described here (below you will explanation of quality scores and their meaning). Today, the FASTQ Sanger version of the format is considered to be the standard form of FASTQ. Galaxy is using FASTQ Sanger as the only legitimate input for downstream processing tools and provides a number of utilities for converting FASTQ files into this form (see NGS: QC and manipulation section of Galaxy tools). 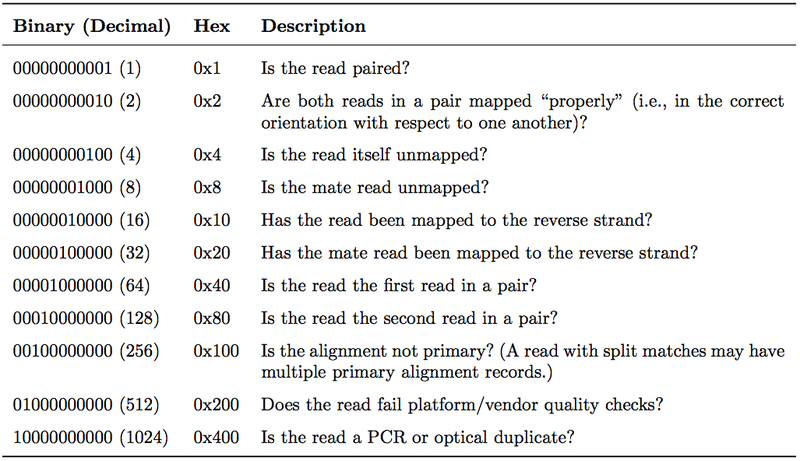 It is common to prepare pair-end and mate-pair sequencing libraries. This is highly beneficial for a number of applications discussed in subsequent topics. For now let’s just briefly discuss what these are and how they manifest themselves in FASTQ form. Note that read IDs are identical in two files and they are listed in the same order. In some cases read IDs in the first and second file may be appended with /1 and /2 tags, respectively. Here the first and the second reads are identified with /1 and /2 tags. FASTQ format is not strictly defined and its variations will always cause headache for you. See this page for more information. base qualities for each nucleotide in the read. Illumina sequencing is based on identifying the individual nucleotides by the fluorescence signal emitted upon their incorporation into the growing sequencing read. Once the fluorescence intensities are extracted and translated into the four letter code. The deduction of nucleotide sequences from the images acquired during sequencing is commonly referred to as base calling. Due to the imperfect nature of the sequencing process and limitations of the optical instruments, base calling will always have inherent uncertainty. This is the reason why FASTQ files store the DNA sequence of each read together with a position-specific quality score that represents the error probability, i.e., how likely it is that an individual base call may be incorrect. The score is called Phred score, , which is proportional to the probability that a base call is incorrect, where . For example, a Phred score of 10 corresponds to one error in every ten base calls (), or 90% accuracy; a Phred score of 20 corresponds to one error in every 100 base calls, or 99% accuracy. A higher Phred score thus reflects higher confidence in the reported base. To assign each base a unique score identifier (instead of numbers of varying character length), Phred scores are typically represented as ASCII characters. At http://ascii-code.com/ you can see which characters are assigned to what number. 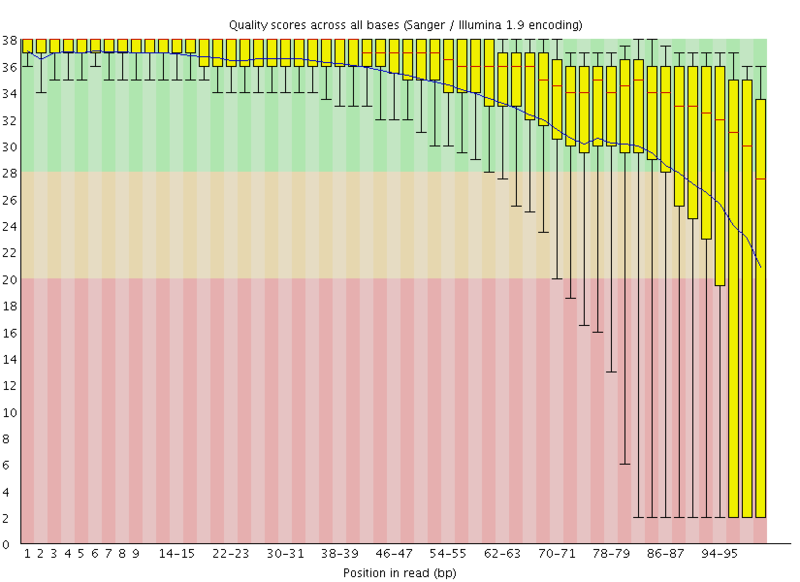 For raw reads, the range of scores will depend on the sequencing technology and the base caller used (Illumina, for example, used a tool called Bustard, or, more recently, RTA). Unfortunately, Illumina has been anything but consistent in how they calculated and ASCII-encoded the Phred score (see below)! In addition, Illumina now allows Phred scores for base calls with as high as 45, while 41 used to be the maximum score until the HiSeq X. This may cause issues with downstream sapplications that expect an upper limit of 41. Base call quality scores are represented with the Phred range. 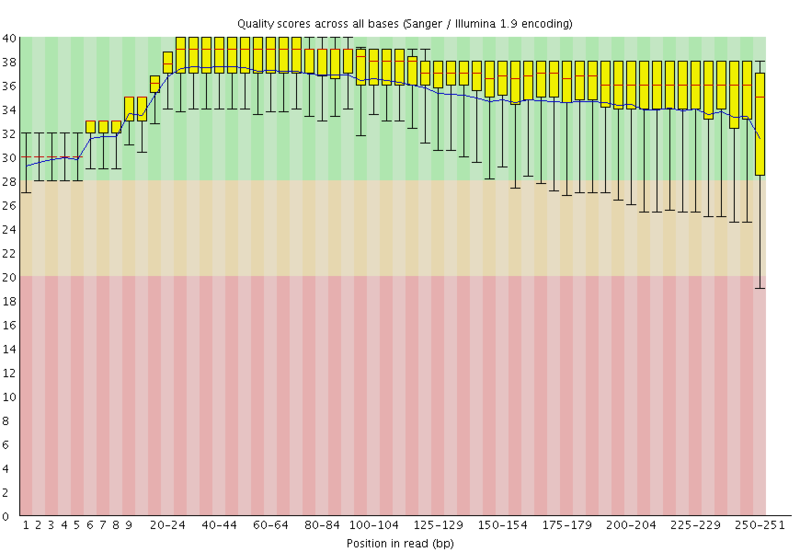 Different Illumina (formerly Solexa) versions used different scores and ASCII offsets. Starting with Illumina format 1.8, the score now represents the standard Sanger/Phred format that is also used by other sequencing platforms and the sequencing archives. One of the first steps in the analysis of NGS data is seeing how good the data actually is. FastqQC is a fantastic tool allowing you to gauge the quality of FASTQ datasets (and deciding whether to blame or not to blame whoever has done sequencing for you). Here you can see FastQC base quality reports (the tools gives you many other types of data) for two datasets: A and B. The A dataset has long reads (250 bp) and very good quality profile with no qualities dropping below phred score of 30. The B dataset is significantly worse with ends of the reads dipping below phred score of 20. The B reads may need to be trimmed for further processing. QC datasets you have uploaded before. 2009 Bowtie 1 - Langmead et al. 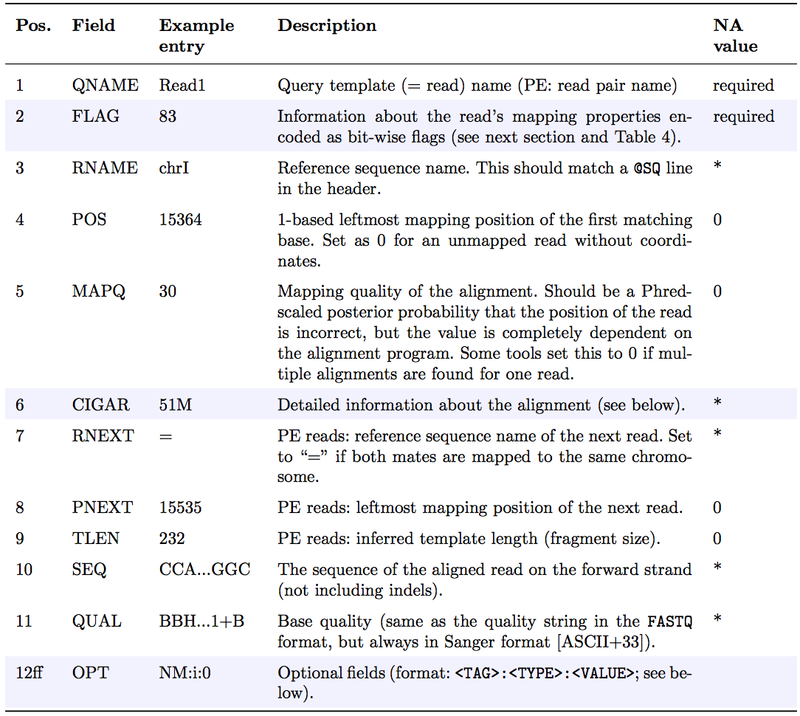 Mappers usually compare reads against a reference sequence that has been transformed into a highly accessible data structure called genome index. Such indexes should be generated before mapping begins. Galaxy instances typically store indexes for a number of publicly available genome builds. Mapping against a pre-computed index in Galaxy. For example, the image above shows indexes for hg38 version of the human genome. You can see that there are actually three choices: (1) hg38, (2) hg38 canonical and (3) hg38 canonical female. The hg38 contains all chromosomes as well as all unplaced contigs. The hg38 canonical does not contain unplaced sequences and only consists of chromosomes 1 through 22, X, Y, and mitochondria. The hg38 canonical female contains everything from the canonical set with the exception of chromosome Y.
Map datasets uploaded before using BWA against hg38 version of the human genome. If Galaxy does not have a genome you need to map against, you can upload your genome sequence as a FASTA file and use it in the mapper directly as shown below (Load reference genome is set to History). The SAM/BAM format is an accepted standard for storing aligned reads (it can also store unaligned reads and some mappers such as BWA are accepting unaligned BAM as input). The binary form of the format (BAM) is compact and can be rapidly searched (if indexed). In Galaxy BAM datasets are always indexed (accompanies by a .bai file) and sorted in coordinate order. In the following duscussion I once again rely on tutorial by Friederike Dündar, Luce Skrabanek, and Paul Zumbo. 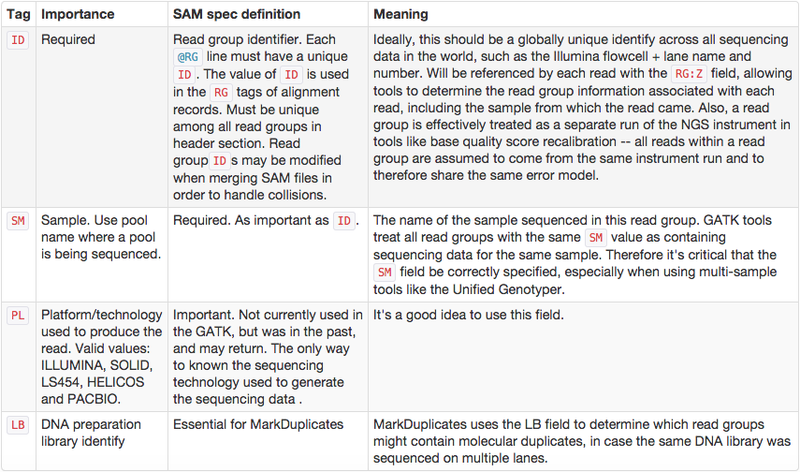 The Sequence Alignment/Map (SAM) format is, in fact, a generic nucleotide alignment format that describes the alignment of sequencing reads (or query sequences) to a reference. The human readable, TABdelimited SAM files can be compressed into the Binary Alignment/Map format. These BAM files are bigger than simply gzipped SAM files, because they have been optimized for fast random access rather than size reduction. Position-sorted BAM files can be indexed so that all reads aligning to a locus can be efficiently retrieved without loading the entire file into memory. As shown below, SAM files typically contain a short header section and a very long alignment section where each row represents a single read alignment. The following sections will explain the SAM format in a bit more detail. For the most comprehensive and updated information go to https://github.com/samtools/hts-specs. Schematic representation of a SAM file. Each line of the optional header section starts with “@”, followed by the appropriate abbreviation (e.g., SQ for sequence dictionary which lists all chromosomes names (SN) and their lengths (LN)). The vast majority of lines within a SAM file typically correspond to read alignments where each read is described by the 11 mandatory entries (black font) and a variable number of optional fields (grey font). From tutorial by Friederike Dündar, Luce Skrabanek, and Paul Zumbo. The following table explains the format and content of each field. The FLAG, CIGAR, and the optional fields (marked in blue) are explained in more detail below. The number of optional fields can vary widely between different SAM files and even between reads within in the same file. The field types marked in blue are explained in more detail in the main text below. The FLAG field encodes various pieces of information about the individual read, which is particularly important for PE reads. It contains an integer that is generated from a sequence of Boolean bits (0, 1). This way, answers to multiple binary (Yes/No) questions can be compactly stored as a series of bits, where each of the single bits can be addressed and assigned separately. The following table gives an overview of the different properties that can be encoded in the FLAG field. The developers of the SAM format and samtools tend to use the hexadecimal encoding as a means to refer to the different bits in their documentation. The value of the FLAG field in a given SAM file, however, will always be the decimal representation of the sum of the underlying binary values (as shown in Table below, row 2). 4: The read is unmapped (0x4 is set). 69 (= 1 + 4 + 64) The read is paired, is the first read in the pair, and is unmapped. 77 (= 1 + 4 + 8 + 64) The read is paired, is the first read in the pair, both are unmapped. 83 (= 1 + 2 + 16 + 64) The read is paired, mapped in a proper pair, is the first read in the pair, and it is mapped to the reverse strand. 99 (= 1 + 2 + 32 + 64) The read is paired, mapped in a proper pair, is the first read in the pair, and its mate is mapped to the reverse strand. 133 (= 1 + 4 + 128) The read is paired, is the second read in the pair, and it is unmapped. 137 (= 1 + 8 + 128) The read is paired, is the second read in the pair, and it is mapped while its mate is not. 141 (= 1 + 4 + 8 + 128) The read is paired, is the second read in the pair, but both are unmapped. 147 (= 1 + 2 + 16 + 128) The read is paired, mapped in a proper pair, is the second read in the pair, and mapped to the reverse strand. 163 (= 1 + 2 + 32 + 128) The read is paired, mapped in a proper pair, is the second read in the pair, and its mate is mapped to the reverse strand. CIGAR stands for Concise Idiosyncratic Gapped Alignment Report. 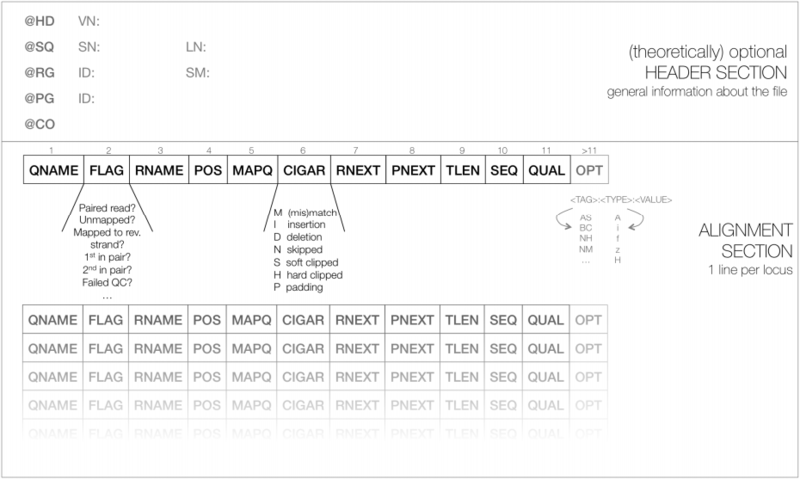 This sixth field of a SAM file contains a so-called CIGAR string indicating which operations were necessary to map the read to the reference sequence at that particular locus. N - Skipped region from the reference. For mRNA-to-genome alignments, an N operation represents an intron. For other types of alignments, the interpretation of N is not defined. From tutorial by Friederike Dündar, Luce Skrabanek, and Paul Zumbo. RG:Z - Read group (should match the entry after ID if @RG is present in the header. Thus, for example, we can use the NM:i:0 tag to select only those reads which map perfectly to the reference(i.e., have no mismatches). While the optional fields listed above are fairly standardized, tags that begin with X, Y, and Z are reserved for particularly free usage and will never be part of the official SAM file format specifications. XS, for example, is used by TopHat (an RNA-seq analysis tool we will discuss later) to encode the strand information (e.g., XS:A:+) while Bowtie2 and BWA use XS:i: for reads with multiple alignments to store the alignment score for the next-best-scoring alignment (e.g., XS:i:30). Perform a similar analyses with your own data. Preparation of sequencing libraries (at least at the time of writing) for technologies such as Illumina (used in this examples) involves PCR amplification. It is required to generate sufficient number of sequencing templates so that a reliable detection can be performed by base callers. Yet PCR has it’s biases, which are especially profound in cases of multitemplate PCR used for construction of sequencing libraries (Kanagawa et al. 2003). 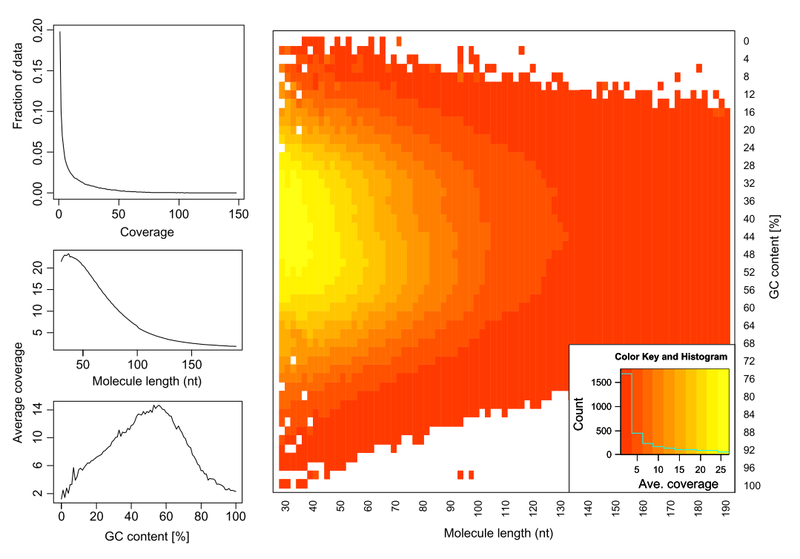 Analyzing molecules aligning with the same outer coordinates, a mapping quality of at least 30 and a length of at least 30nt, resulted in an average coverage of 12.9 per PCR duplicate and an empirical coverage distribution similar to an exponential/power law distribution (left upper panel). This indicates that many molecules are only observed for deeper sequencing while other molecules are available at higher frequencies. Analyzing length (left middle panel) and GC content (left lower panel) patterns as well as the combination (right panel) shows higher PCR duplicate counts for a GC content between 30% to 70% as well as for shorter molecules compared to longer molecules. This effect may be due to an amplification bias from the polymerase or the cluster generation process necessary for Illumina sequencing. From Ph.D. dissertation of Martin Kircher). The Variant Allele Frequency (VAF) bias determined by coverage and insert size variance. Reads are paired-end and read length is 76. 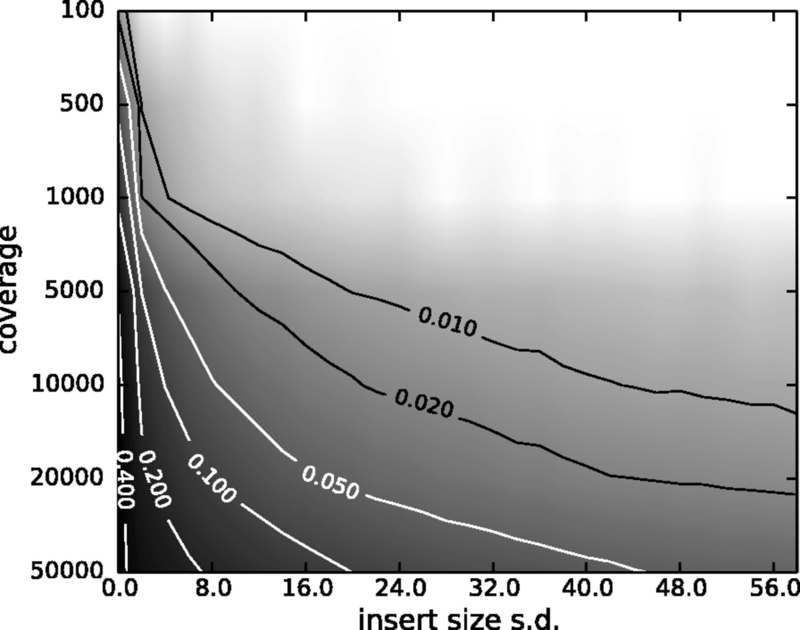 The insert size distribution is modeled as a Gaussian distribution with mean at 200 and standard deviation shown on the x-axis. The true VAF is 0.05. The darkness at each position indicates the magnitude of the bias in the VAF. (From Zhou et al. 2013). Data can be uploaded directly from a computer, from EBI SRA and from NCBI SRA, also using FTP or URL. FASTQ Sanger version of the format is considered to be the standard form of FASTQ. Paired end data can be provided as two files or as an interleaved one. FastqQC is a tool allowing to check the quality of FASTQ datasets. The most common tools for mapping are Bowtie, BWA, BWA-MEM. You can use in-built genome to map against or upload one if it is missing. The standard format for storing aligned reads is SAM/BAM. The major toolsets to process these datasets are DeepTools, SAMtools, BAMtools and Picard.